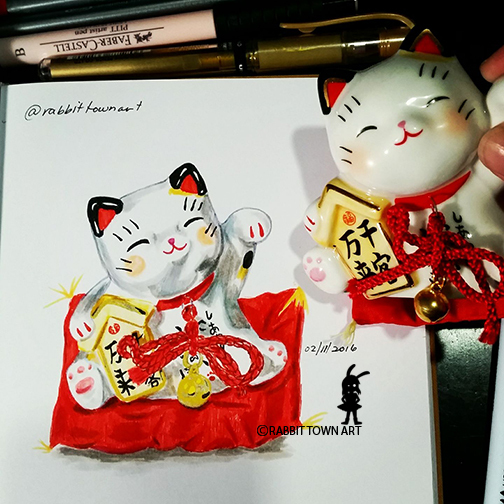 A Lucky kitty I drew....a month ago. Insane. Where is the time going? Is it just me or did this year just fly past? Did a lot of work, drawings and chores today. A very, very full day indeed. Feeling good about it. I want to smash out 2 scenes at work tomorrow if I can. Yup...but work has bee getting a bit distracting with meetings and stuff. Sigh...like Monday was a write off with meetings and party, so that was good but not great for productivity. Need to get stuff done! I have slowed down though, productivity-wise. Tends to happen during the Christmas Season. Not much else...cos it's bed time!! !